Fr Agbonkhianmeghe Orobator SJ has been appointed President of the Conference of Major Superiors of Africa and Madagascar (JESAM) by Father General. Currently the Principal of Hekima University College in Nairobi, he will take over from Fr Michael Lewis SJ on 16 February. 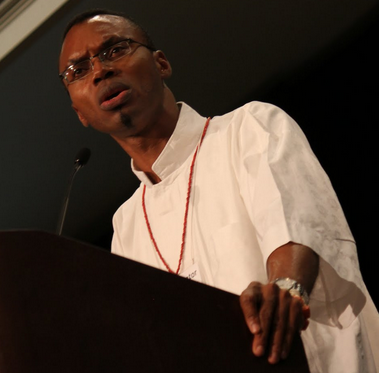 Fr Orobator is a member of the Eastern Africa Province of the Society of Jesus and comes originally from Nigeria. He received his PhD from the University of Leeds in 2004 and served as Rector of the Hekima Community from 2006. He was appointed Provincial Superior of the Eastern Africa Province, which includes Kenya, Uganda, Tanzania, Ethiopia, Sudan and South Sudan, from 2009 to 2014. In October 2013, Fr Orobator delivered CAFOD’s annual Pope Paul VI memorial lecture at King's College London. It was entitled "A billion reasons to believe in Africa: The long march from 'the hopeless continent' to 'the spiritual lung of humanity". He is currently serving as Principal of Hekima University College Jesuit School of Theology and Institute of Peace Studies and International Relations in Nairobi, Kenya, a Campus College of The Catholic University of Eastern Africa. Fr Orobator’s research focuses on theological ethics and ecclesiology of the global south. He is in demand as a speaker all over the world as a theological speaker with a particular expertise in African Theology, about which he has written several books. His most recent publication, The Church We Want: African Catholics Look to Vatican III, was published last year by Orbis; it was launched in the UK at Heythrop College and was reviewed in the winter 2016 edition of Jesuits and Friends. He is also a contributor to the online journal of the Jesuits in Britain, Thinking Faith. Announcing Fr Orobator's appointment, the current President of JESAM, South African Fr Lewis said: "We wish him God’s blessings and help as he takes on this new appointment." 37 min 15 sec ago.